We Chose Death! Our Father/Creator Chose Life For Us! 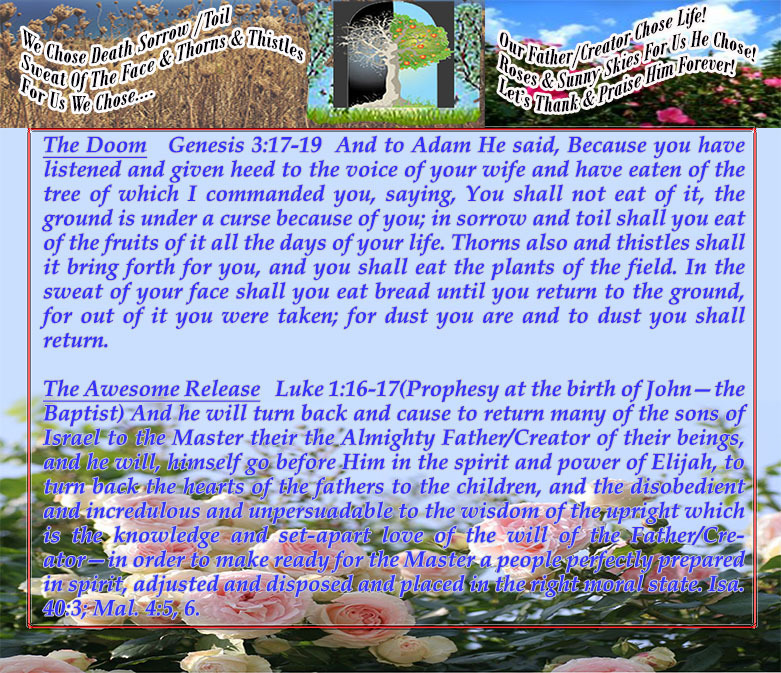 This graphic is to illustrate the fact that though our Father created us to live in the joy of His Presence forever—a life in a garden of roses & trees & beauty beyond measure, even so, our Father/Creator of necessity had to expel us from that beautiful garden and doomed us to the present life of sorrow & toil! Why? The first man, Adam chose to disobey Him and eat of the forbidden tree! The Father/Creator had no choice but to let Adam suffer the spiritual death that Adam brought upon himself! From there on the fate of human kind was decreed and that garden of roses & trees & beauty beyond measure was to be no more for the human kind! The bed of roses that could have been our sit was no more! Instead we were doomed to the thorns and thistles that we produce by the sweat of our brow! But why are we to suffer for what Adam did? Ah! Because, tenaciously, we have continued to eat from the tree of the knowledge of good & evil! WHAT? Hum! Do not kid yourself—we, like our famous Eve, always do whatever seems good to us and to our peers! But, not all that shines is gold! What seems good to us is actually a stench to the nostrils of our Father/Creator because all of our goodness stem from the forbidden tree no matter how good it seems to us! Make no mistake about it, the human mind is the opposite of the mind of our Father/Creator, thus we are commanded not to depend on our human mind! Unfortunately, we ignore such command and proceed to do what seems good to us or what we understand to be good. Of course, it seems good to us to ‘study the Scriptures’ and practice whatever it is written. Thus we cement ourselves in whatever we understand of the Scriptures and we allow no one to dislocate us from our understanding of the Scriptures—no one, not even our Messiah Himself can move us! Even so, the time is here when again we can sit on a bed of roses so to speak and enjoy the Presence of our Father/Creator in our hearts! Yes, once again we are granted access to a spiritual paradise while we wait for the soon return of our Messiah! How? What am I talking about? I am talking about what is written because ALL things pertaining to our past, present & future have been written and all those things are & have been happening exactly as it is written. Thus, I am proclaiming what is written about the past & the present time—the pronounced doom or punishment and the announcement of our release from the deserved doom that we inherited from our ancestors. History repeats itself! Read it & rejoice! For the time is here for the Father/Creator to raise up His mouthpieces in the likeness of the spirit & power of the prophet Elijah! We are His mouthpieces. We are not prophets or scholars or Indian chiefs at all. I am a mouthpiece for our Father/Creator. For our Father’s will is for all to see and come to terms with the spiritual reality of our redemption! No need to suffer any longer! Our Father/Creator is for real! He is calling ALL to return to Him and enjoy a better life than what this world has to offer even now while we are still in this world! Hearken into His Presence!